The What:Leyard recently unveiled the Leyard CarbonLight LED display solutions, a family of flexible, lightweight displays constructed to meet a broad range of creative indoor and outdoor applications. The What Else: Leyard CarbonLight LED displays are designed to be lightweight, thin, strong, and adaptable for high-impact events served by rental and staging companies, and for fixed and semi-fixed installations with unique design requirements. 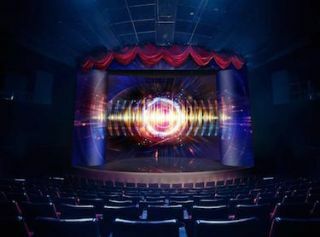 The displays are available in five different product configurations for indoor, outdoor, hanging, floor-mounted, corner-beveled, and curved video wall installations. The Leyard CarbonLight line was designed for businesses renting AV equipment and live events. It is also intended for fixed installations that require a high level of flexibility, either because of the unique requirements of the installation space, like broadcast set designs, or because a customer requires a video wall solution that can be moved or transformed into different physical configurations over time. The Bottom Line: The LED displays are ultra-lightweight due to their carbon fiber construction and patented designs, making them a viable option for environments with limited structural capacity. They are easy to transport, incorporate hardware that is fast to install and take down, and are quick to service, with a hardware design that allows for middle-display replacement. Leyard CarbonLight displays also support many unusual configurations including right-angle corners, perfectly smooth concave and convex arcs, and floor installations.